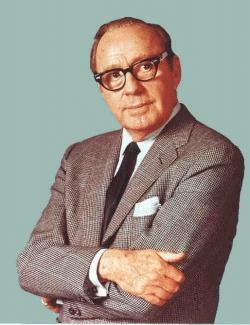 40 years ago today the world lost one of the greatest comedians who ever lived when Jack Benny died at the age of 80….of course, Jack would have insisted that he was 39. Jack Benny’s career ranged from vaudeville to radio to movies to television to concert stages to personal appearances….and he continued to perform almost until his death from pancreatic cancer. He was even set to co-star with Walter Matthau in the film The Sunshine Boys….that role would played instead by Benny’s best friend of 55 years, George Burns. I’ll bet that Jack would have been pleased that George’s career was revived by his Oscar-winning turn in the movie. NBC aired a half-hour tribute tribute on December 27th that was hosted by Tom Snyder and CBS aired the following hour-long tribute on December 29th, the day of Benny’s funeral. Hosted by Charles Kuralt, this special includes comments from Benny’s co-stars Eddie “Rochester” Anderson, Frank Nelson, Don Wilson, Dennis Day and Mel Blanc, plus Milton Berle, Danny Thomas, Danny Kaye, CBS founder/chairman William S. Paley, Bob Hope’s eulogy at the services and a wonderful clip to end the broadcast….Jack and Gisele MacKenzie with their classic violin duet of “Getting to Know You”. Today’s Christmas video is actually audio-only….a 2-part presentation of a 1945 Capitol Records set, On the Night Before Christmas, featuring Jim and Marian Jordan as their famous radio characters Fibber McGee and Molly (with Marian doing double-duty as Teeny, their young neighbor). This is a delightful story with a wonderful rendition of T’was the Night Before Christmas by the King’s Men and Billy Mills and His Orchestra (vocal arrangement by Ken Darby). It’s funny how something so seemingly insignificant at the time can actually be a turning point in one’s life. 40 years ago today – June 2, 1973 – I was looking at the tv/radio page of the newspaper and saw a listing for a nostalgia program on WCNY-FM called All Our Yesterdays that indicated that excerpts from Henry Morgan’s radio show would be featured. Curious, I tuned in and heard a sketch called “Long Distance” that had me almost on the floor with laughter. I can’t fully do justice to this sketch by describing it but it was about Morgan trying to make a long distance call from Truro, MA to Los Angeles and having to go through 6 operators to get through to his party. Trust me: it was very funny. Anyhoo, the point is that if I had not seen that item in the newsaper, I would not have tuned in to All Our Yesterdays. If I had not tuned in to All Our Yesterdays, I would never have become a fan of Old Time Radio, aka OTR. If I had not becomea fan of OTR, I would never have tuned in to the followup to All Our Yesterdays, The Sounds of Yesterday (a summer replacement that wouuld last for nearly 10 years). If I had never tuned in to The Sounds of Yesterday, I never would have met and become friends with the program’s co-hosts, Allen Rockford and Don Richardson (and subsequently, another OTR fan named Gerry Orlando). If I had not met Allen and Don (and Gerry), I might not have bothered to attend the “Nostalgia Mini-Convention” that was held at the WCNY studios to celebrate the program’s 3rd anniversary. Trust me…I’m getting to the BIG points of this post. If I had not gone to the Nostalgia Mini-Convention, I never would have met my best friend of 37 years, Walt Mitchell. That, in and of itself, is something to celebrate….but there’s more! If Walt and I hadn’t met, we never would have attended the Friends of Old Time Radio convention and met so many wonderful friends….both performers and fellow fans. We attended FOTR 33 times (32 times for me, as I missed 2005 because of my stroke) and we have tons of great memories. But, of course, there is one other important thing that came out of all of this. 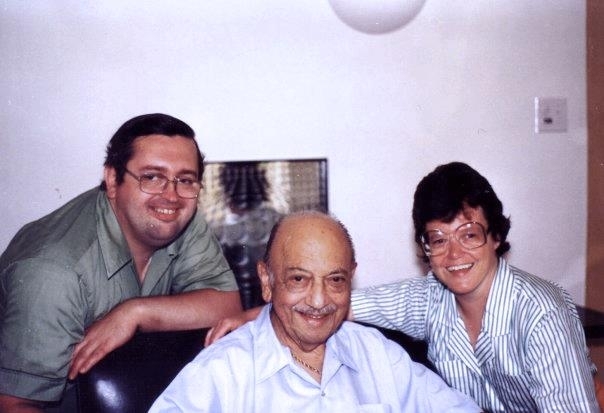 If Walt and I had never met, we never would have met and become friends with Mel Blanc, Mel’s wife Estelle and their son Noel. No seeing Mel present his college talks in different cities….or seeing him honored at the Smithsonian in 1984. No visits with Mel out in California. No having that dear man in our lives. As for Old Time Radio itself, it has given me countless hours of terrific entertainment….comedy, drama, variety. Radio was the theater of the mind, opening up a fantastic world of fantasy. There is nothing else like it….television can be wonderful (especially the “Golden Age” of television in the 1950s) but nothing can beat listening to radio actors and actresses (and let’s not forget the sound effects artists!) ply their craft and take you on an adventure that is limited only by your imagination. These programs have given me a great amount of joy. NONE of these things would have happened if I hadn’t seen that little notice in the newspaper that a local nostalgia program was going to air excerpts from Henry Morgan’s radio program. It’s amazing how something so little could lead to so much. It’s hard to believe that 40 years have passed since that Saturday in June 1973….but it’s been a great 40 years!